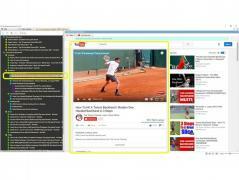 MyVideoIndex Viewer is a versatile web browser and personal video manager. It provides video viewing and cataloguing capabilities that are very easy to use. The program enables you to group your videos based on subjects as well as download existing catalogs from MyVideoIndex.com. As soon as you load a catalog into MyVideoIndex Viewer you can start watching videos one-by-one (like in a playlist) via its intuitive layout. This application makes it extremely easy to organize your personal videos, as well as discover new video collection. On top of that it has a built-in web browser.